Falling in love with a destination is not completely unlike falling in love with a person. There are powerful images, rich in detail and feeling, that become memorable. Those images are not exactly random, but they are not predictable, either. I enjoyed many such moments during my first Asian trip, in places such as Chiang Mai, Amphawa, Kanchanaburi, Bangkok or Ko Samet But, reflecting on those days, some of the most powerful images go back to my three and a half days in Kuala Lumpur, a dull city for many, yet a magical place for me. I remember, for instance, my first evening in town – which happened to be my first evening in Asia. I walked from my hotel in Bukit Bintang to Jalan Alor street, where I was mesmerized by all the restaurants with the outdoor seating areas, all packed with Chinese patrons – locals, I assumed. As I drank from my decently priced large bottle of Carlsberg and ate delicious food I could not name (Hokkien Mee, it turned out) I took it all in – the action, the smells, the colors, the heat and humidity. Turns out I was having Hokkien mee! “Oh yes – Jalan Alor. That’s where the tourists go” said Jane, a Chinese-Malaysian friend, when I was telling her the day after. We were watching the fountain show at KLCC, under the Petronas tower. No alcohol that night – just ice-cream after a delicious Chinese-Malaysian meal at the food court of one of the many malls in Bukit Bintang. As I gazed at the colors, I felt so so far away from home. No wonder: come think of it, I had never been this far from home. Three weeks later, I came back to KL for a short evening before my flight back to Europe. After Thailand and all my solo travel adventures, I saw this last evening as an unnecessary drag. I was tired of my trip and the prospect of spending time and money in KL did not appeal to me. But I met couchsurfer Selena, a generous and energetic soul who made me laugh as she drove me around Putrajaya. 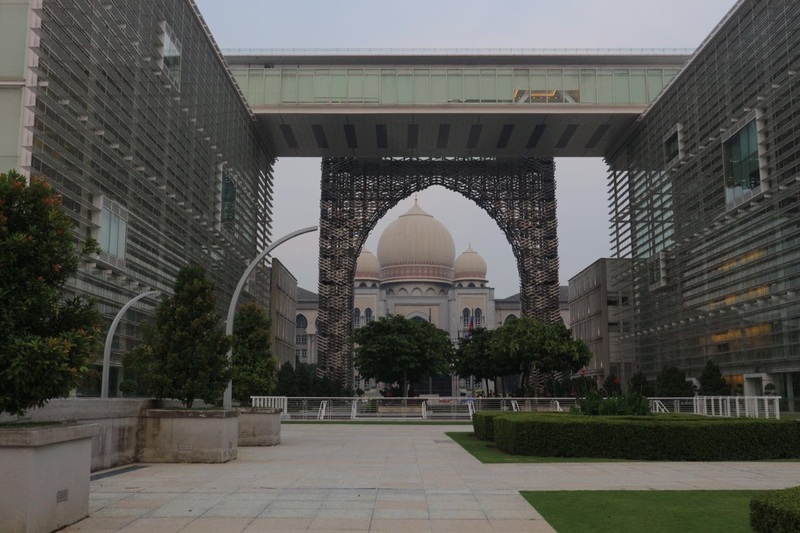 Ah, Putrajaya: Malaysia’s administrative capital, purpose-built and packed, I assumed, with boring and predictable civil servants. A fake town, really, almost Disney like – so much order, so much symmetry, so…soothing after the chaos of Thai cities. It was quiet as most of the civil servants had already left, too early to enjoy the beautiful sunset. We visited a number of grandiose buildings and mosques, and then Selena and I had cheap and tasty satay at a the artificial lakefront, before heading to the city centre for my first taste of Durian and (yet) another skybar experience. Fun, for sure, but the heart has its own mysterious ways and mine decided to stay in quiet Putrajaya. Malay satay is second to none!